Detective-Inspector Gray of Scotland Yard demands that Dixon Hawke reveal the location of accused murderer Jevons, but Hawke in convinced of the man's innocence. Can he prove it before the Yard finds its man? Dixon Hawke and Tommy Burke were busy in the former's study discussing the strange circumstances of their latest case, when the impatient ringing of the door-bell disturbed them. In a few moments Mrs. Benvie, the housekeeper, announced Detective-Inspector Gray of Scotland Yard, and when Gray came into the room it was obvious from his face that he was in anything but a pleasant mood. "Now look here, Hawke," he burst out as the private detective rose to his feet. "Have you seen this man Jevons or haven't you? Serious business shielding a man wanted for murder. He was seen coming towards your flat, and — "
"I have seen Jevons and his wife," admitted Hawke before Gray could say anything further. "They are a young, intelligent couple, newly married, and the reason why I'm unwilling to hand Jevons over to you yet is that I'm convinced of his innocence. Listen. There are those two, making the best of uncongenial jobs as steward and stewardess of a low, riverside club at Wapping. Jevons has learned to deal with the tough characters who frequent the place, and he is involved in a dispute with one of them while his wife is upstairs cleaning the rooms and the proprietor Is in some other part of the building. "The customer, a much-hated general dealer and moneylender named Blair, gets rough, and Jevons throws him down, so that he strikes his head on the iron leg of a table. "At that point the proprietor enters the room, looks at the stunned man, and says to Jevons: 'You've killed him! Better scoot before the police arrive.' He then pushes Jevons out through the door, and, bewildered. Jevons hurries away a few paces, and then stops to think things over. "He is about to return when he hears a scream and his wife comes rushing out. .She tells him that Blair is lying on the floor in a pool of blood. She can't find the proprietor, Mr. Howson, and, as there is no one else in the place, she is wondering what to do. "But Mrs. Jevons is afraid to go back, and they stand there on the river foreshore at the foot of Blissett Hill, gaping at the club building and debating the matter for several minutes. "'He's dead,' insists Mrs. Jevons. 'The floor's covered with blood. There's nothing you can do. Don't go back — it might make things worse for you.' Then the police arrive, and the two hear one of the officers tell a colleague that Blair has been — stabbed to death. "You will say that the next action of the Jevonses was unwise, and perhaps it was. They came to me to ask my advice." "A jury would say they ran away," remarked Gray. "And if your suggestion is that Howson stabbed Blair after Jevons left, I can only say that there's no evidence to support it. There's no trace of the knife, and the man who killed Blair must have got a lot of blood on his clothes." "I dare say he changed." "Howson had more chance of changing. It transpires that he hadn't gone for the police at all. He telephoned them from the club. They were on the scene within a couple of minutes of receiving his phone message, but that was nearly ten minutes after Jevons had left the place." "How are you going to prove that?" Gray rose and took his hat. "I'm expected to arrest Jevons within a few hours," he said significantly. "In a few hours," returned Hawke, "you shall have him, if you still want him by that time." Half an hour later Hawke and his assistant were viewing the riverside buildings from the deck of a steamer anchored in mid-river. On his arrival on the river front, he had not been slow to note the ship's position in relation to the scene of the crime, and on hearing that she had been at anchor there, awaiting a berth, since the previous morning, his interest in her had intensified and he had immediately engaged a waterman to row him and his assistant out to her. "All foreign people," said the man in the light blue boiler-jacket and black woollen cap, who was standing by Hawke's side on the steamer's deck, "is a fool, an' I t'ink it good for a man to know when 'e's a foreign." "You don't believe in going ashore and getting robbed in foreign ports, eh?" smiled Hawke. "I stop 'ere," answered the Swedish deckhand, "an' look at 'im t'rough my spyglass. Dere ain't no end to de trouble a sailorsman can get into in de big town. An' de big town just carry on an' don't take no notice, not even if you get — "
He drew his forefinger across his throat and made a bloodcurdling sound. "What 'bout dis man what I see waitin' dere wid de lady when de p'lice come?" went on the Swede. "You say dey're after 'im for a murder what 'e don't done. What's de good to say it ain't dangerous ashore when you get a t'ing like dat 'appen?" Hawke gazed thoughtfully across the smooth, green expanse of water towards Blissett Hill, which shelved steeply to the edge of the river, culminating in a flight of stone steps and a strip of muddy foreshore. He borrowed the Swede's telescope, and focussed it on a certain building at the foot of this street. The Corner Club was a dingy, three-storied house, and against its riverside wall was a decaying old landing-stage, long in disuse. Above the landing-stage was a window, which Hawke studied intently for some moments. "I see one man in dere," said the Swede, "after de man an' de lady run out." "I was lookin', because I t'ink dere must be some troubles doin'. T'rough de window I see de fat one bend over an' look at something on de floor. Den 'e go downstairs. Don 'bout ten minutes after, de p'lice come." "You're sure of the time?" "Yes. Ten minutes. Not no less." "That makes you an important witness. We shall be able to find you here?" "'Ere till to-morrow morning's tide. Den we go into Jordan's dock." "All right. We'll be getting in touch with you. It might be useful if you can keep an eye on that place while you're here." Hawke and Tommy were rowed ashore once more, and they presently visited the Comer Club. They did not mingle with the customers, but entered through a side door, which gave access to a narrow lane leading to Blissett Street and to another street at the other end. "Jevons assumed that Howson came out this way to fetch the police," remarked Hawke. A moment later he was confronting Howson in the dark passage inside the premises. "I know the police have searched the place," he said in answer to the big, angry-faced man's query, after he had introduced himself, "but they weren't looking for what I'm looking for. They knew Jevons hadn't had time to change his clothes here, and so they weren't looking for traces of bloodstained attire." "'Ere, what you gettin' at?" asked Howson. "I'd rather make a search on my own in preference to falling back on the police — in case I'm wrong." Howson hesitated for a moment, and then grunted his consent. "I notice you have central heating," said Hawke. "Let's have a look at your furnace-room." In the dimly-lit furnace-room Hawke and Tommy were presently perspiring over a glowing heap of ashes which they had raked out. Howson, who had returned for a moment to the bar, shuffled up behind them. "What the devil d'you expect to find?" he demanded. Hawke, in his shirt-sleeves, turned and studied the man's face thoughtfully. The dancing flames from the furnace threw highlights over the coarse features, and seemed to bring out a hard glitter in the eyes. "Buttons," he said. "And I may say I've found some." Howson grunted with an affectation of indifference. "All sorts of rubbish gets chucked in there," he said. "I dunno what you think it's supposed to prove." "My belief is that the murderer of Blair destroyed his blood-stained clothes in this furnace, forgetting that the buttons would survive the flames. And these, I fancy, are the buttons in question. In conjunction with certain other significant little facts I've discovered, it's likely to make quite weighty evidence." "I've got to get back to the bar. I'll show you the rest of the cellars, so you can 'ave a proper nose round. I'd hate you to miss anything." Howson led the way down a flight of stone steps and along a bricked tunnel to a dank, unlighted cellar, which Hawke correctly judged was next to the river. Hawke subsequently blamed himself for what transpired, but he was intent on examining the cellar by the light of his pocket-torch. Howson had struck a succession of matches, the last of which had gone out, and he stood by the doorway as the two visitors entered. The detective had just satisfied himself that the cellar was absolutely bare when he heard a slight noise behind him and a cry from Tommy. He reached the closing door too late. The key turned in the lock, and there was a sound of props being placed against it, though it was stout enough, being of ancient hardwood braced with iron. Howson made no reply to Hawke's shouts, and the two prisoners were at a loss to know what he expected to gain by his action. Both had taken their coats and vests off in the furnace-room, and being still without these had not so much as a penknife between them. The cellar contained nothing but a quantity of coal dust. They had been imprisoned about an hour when they heard a metallic clanking and heavy bumping on the other side of the river wall. The bumping came from somewhere beneath their feet, and after it had continued for a time Hawke hit on the explanation. "The tide's out," he said, "and Howson's driving holes through the foundation wall under the floor. That means the cellar will be flooded when the tide does come in. The water will come up through the cracks between the tiles in a score of places, and, according to my estimation, the tide rises above the level of this ceding." "But I can't believe it! " said Tommy. " How does he think he's going to get away with it?" "He knows we have him nailed," said Hawke, "and, having committed one murder, he's prepared to commit others to save himself. He'll probably try to stage it as an accident, making out that we were unwittingly locked in here. Or he may have other plans for disposing of our remains. We've got to find some way of getting out. What have you in the way of escape tools, Tommy? I have a tobacco-pipe and a box of matches." "I have a pencil and a few copper coins," said Tommy. "Now," said Hawke, after a long pause, "are those things adequate tools for effecting an escape?" "I'm afraid not," said Tommy, somewhat surprised at his chief's brisk tone. "Wrong," said Hawke, switching on his pocket-torch. "Use one of your coins to lever up a tile from the floor, and scrape me up some clay. Meanwhile, give me your pencil." Hawke took the pencil and bit into it, splitting it longitudinally. He then removed the lead, and put the empty casing in his trouser-pocket. He filled the bowl of his pipe with coal dust, and then, tilting it over, held a succession of matches to it until the coal had begun to glow. Taking the small quantity of dirty clay that Tommy had laboriously scratched up, he packed it over the top of the bowl, sealing it. Moving over to the door, Hawke applied a match to the stem, and a tiny blue flame shot out. Applying the flame to the door just above the lock, and using the deleaded pencil as a blowpipe, he sent a pin-point of intense heat against the woodwork. The paint blistered and crackled, and pungent smoke arose, but progress was exasperatingly slow. "Our coal-gas retort will need further charging before we're through," Hawke said presently. "Put some of that coal-dust in your pockets before it gets wet." He presently tipped out the burnt ashes, and put fresh coal dust on top of that which glowed at the bottom of the bowl. "If I can burn sufficiently far into the wood, right round the lock," he explained as he did this, "it might be possible to kick the lock clean out." The wood smouldered and sparked at the edge of the tiny cut he made, but was too old and hard to catch fire. After an hour he had made a cut right through the door about five inches long. The water was then sluicing icily about their knees. As he gained experience of the job he was able to make slightly faster progress, though the pungent wood smoke stung his eyes and caught his throat. He had been at work two and a half hours, and had cut round three sides of the lock when the bowl of his pipe, which he had been holding with a handkerchief, burned completely through. Hawke pressed on the lock with the ball of his fist. The water was now almost level with the lock. "It gives a little, I think," he said, and, stepping back, raised his foot to kick against it with his heel. At this juncture there was a development that made it seem as though the fates were making a mockery of them. The water surged violently, as though disturbed by some wallowing monster, and its level rose abruptly, reaching Hawke's shoulders and submerging Tommy. The latter bobbed above the surface, gasping. Hawke was standing close up against the door. "Hold on to the comer of the door frame," he said, "and float. The tide's been rising faster outside than in here and the pressure has caused some of the tiles to give. I've pushed the lock through, and I'm just struggling to get my leg out of the hole." The door still refused to budge, on account of the props outside. Hawke presently ducked below the surface of the water, came up for breath, and repeated the operation. The third time he came up triumphantly waving a crowbar that he had dragged through the hole in the door. "I've knocked all the props away," he reported. "Push! " They were drawing breath from within a few inches of the ceiling when, holding on to the top of the door frame, and making a last strenuous effort, they managed to push the door open. They drew a final breath within the cellar, ducked under the doorway, and swam to the end of the tunnel. The door at the top of the stone steps was locked, but it was a flimsy proposition in comparison with the other one, and Hawke shouldered it open. A peep into the furnace-room revealed that they had lost their coats and vests, these pieces of evidence presumably having gone into the boiler fire. By turning at the top of the stairs and crawling past a bar-hatch, the two were able to escape by the side door unobserved, and Hawke was presently telephoning the police. After his arrest, Howson asserted that Hawke and Tommy had been locked in accidentally, but this bluff, apart from its apparent thinness, was quite useless. 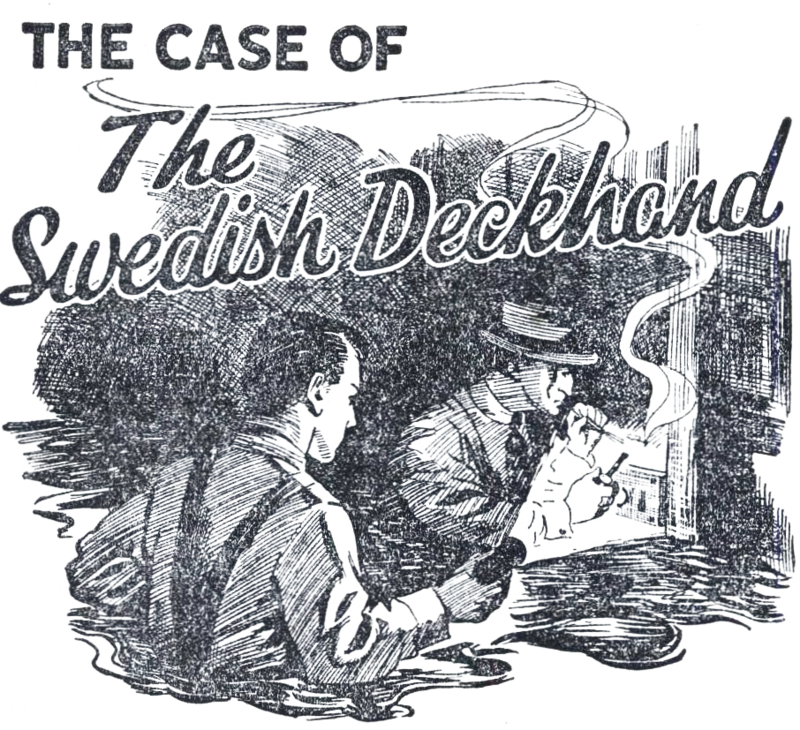 The Swedish deckhand, from his vantage-point aboard the ship in mid-river, had seen him knocking the holes in the foundation wall. "You've seen more from the deck of your ship," said Hawke, "than most people ever see ashore." "P'raps," agreed the Swede, "but dere's a mighty lot goes on behind brick walls what you don't never see." "Yes," agreed Hawke fervently. "Yes, my friend. You are right there."